I didn't particularly want to loop back to Wimbledon, but my choices were constrained since my goal was to meet TfL's criteria for Crossrail 2. They require that CR2 relieves the Northern and Victoria lines. Balham and the Tooting stations relieve the Northern, while Streatham will relieve the Victoria and Northern (as some who take buses from Streatham to reach the tube today would take the new line instead). I can't believe I looked through the whole thing. Some of the percentages on comment add up to more than 100%. What's interesting is that it seems Balham and Tooting has much more support for Totting, while Ally Pally vs Wood Green seems to be split, especially from different interest groups. I need to look at a map to see how close Euston and St. Pancras are. A conjoined Euston-Kings Cross TfL complex seems like something that must be heavily designed to ease congestion and also act as a flagship station complex. I wonder how pressure might increase on the Vicc to Kings Cross as CR2 passengers might switch to the Circle/H&C or even the Picc to Aresnal for games. What I don't understand in the Wood Green/Turnpike Lane option (as well as others that I'm not as knowledgable) is how the listed architecture would be retained. Turnpike Lane seems like it could adopt another line with less damage, but Wood Green is a very tight station. That didn't seem to be an issue for those areas, expect for English Heritage. When Mrs tbf & I did some abandoned Tube station photography in 2013, we took the Tube from Euston to Kings Cross, rather than walk-think it was down in the book as over half-a-mile, so if that is the case, nowhere near close enough to make a complex, I would think. how the listed architecture would be retained. Listing does not preclude alteration, or even demolition - it just makes it much harder to get permission. 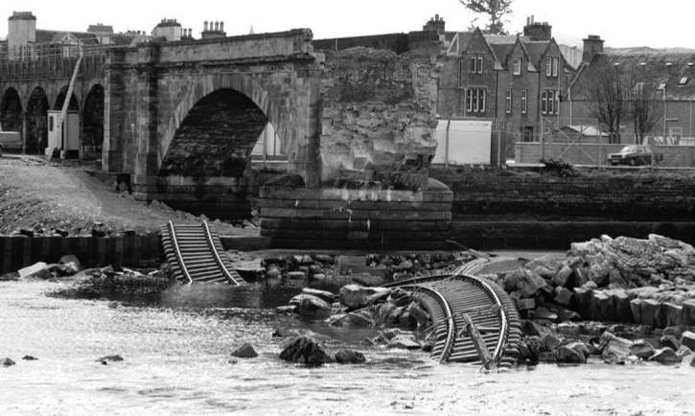 (In 1990 British Rail had to apply for permission to replace the listed bridge over the River Ness, with a new viaduct . This was despite the "listed building" having already been swept away by a storm the previous year, isolating the entire "Far North" network). we took the Tube from Euston to Kings Cross, rather than walk-think it was down in the book as over half-a-mile, so if that is the case, nowhere near close enough to make a complex, I would think. The closest points of Euston and St Pancras are about 400metres apart. Between the entrances to the Tube stations, about double that. But you will walk almost as far underground if you take the Tube. Thanks-that still seems a considerable gap to bridge in terms of making one site, whether through length of walkways below, or property acquisition/alteration above ground. I'd expect the British Library to present some difficulties with this anyway. Does anyone know how many floors they have below ground? A group of my friends decided to find out which was the swiftest way from Platform 9¾ to Euston concourse. Some went on foot, some the underground and one fool wanted to catch the bus; the rule was no running. The underground won as a train was in the platform when they arrived at the platform, followed very shortly by the foot team. The bus was late, as usual. The new Francis Crick institute are the ones kicking up the fuss about CR2. They're saying the line will run under their new building and "upset" all their expensive fancy equipment. If you consider what is already under Euston and Kings Cross then it's pretty clear that CR2 would have to be somewhat to the north of both stations and pretty deep to get under everything. I doubt the British Library is too much of an issue but I haven't checked the CR2 route in particular detail to verify this. I do know where the F Crick institute is though! Most of the British Library site is outside of the safeguarded CR2 alignment. Given the sheer scale of Crossrail type stations I don't see much of an issue about a double ended KX / Euston CR2 station being able to connect into the respective main line stations. Sure some of the connections are going to be very long but that's true for CR1 stations too. It's not exactly going to be a breeze to change between the Met and Crossrail at Farringdon or between the Northern and Crossrail at Moorgate. People will be walking / using stairs and escalators for several minutes to interchange. Get on the "wrong" end of a busy CR train and you'll have a heck of walk if the station exit you want is at the opposite end to where you boarded. You won't be doing 2 minute mad dashes from Crossrail to the Anglia main line platforms at Liverpool Street. It'll be a 4-5 min mad dash assuming you're very quick on your feet and good at dodging past people. It's not exactly a breeze to change between the northbound Thameslink and northbound/westbound Met at Farringdon if you need to use lifts. I did this with my mother to avoid what I knew was a long walk from SPILL to King's Cross mainline. I'm not sure we actually saved any walking distance at all (we were on a short TL train that stopped at the far west end of Farringdon, the signs directed us all the way back to the east end, up to the NR ticket hall, down to the southbound NR platform, half way along that then I think I just carried her luggage up a short flight of stairs rather than figure out how to get up to the LU level step-free. Crossrail 2 have published a "response to issues raised" from the last round of consultation. Final decisions have not been reached on the route options nor have all station designs / locations been finalised. Some effort is being made to reduce the impact of worksites in a number of locations. As I understand it, the plan in Wood Green is to knock down the building containing the cinema opposite the existing station and have a second entrance on that site to the south. An update on CR2 progress from the TfL Commissioner's Report. Work continues to finalise the Strategic Outline Business Case (SOBC) for submission to the Government in March 2017. Drafts of the five cases (commercial, economic, financial, management and strategic) have been shared, and comments received from sub-panel members, the Crossrail 2 Programme Board, GLA colleagues and the Department for Transport (DfT). A series of meetings and detailed briefings are planned before submission, to ensure a robust and comprehensive SOBC – including a further session with Lord Ahmad, Parliamentary Under Secretary of State for Transport and a workshop with members of the DfT’s Business Investment and Commercial Committee. The Crossrail 2 Programme Board also met in January to further comment on the SOBC. There has been good progress and joint working with the Greater London Authority in preparing the Housing Delivery Report, which will be included as an appendix to the SOBC. This will explain how we will deliver the 200,000 new homes proposed along the route. There has also been extensive work undertaken to ensure Crossrail 2 aligns with the Strategic Housing Land Availability Assessment and wider London Plan discussions. The team are working towards the next route-wide public consultation, which will take place later this year following submission and endorsement of the SOBC. Discussions are continuing with DfT officials regarding an update to the safeguarding directions. What a horrible dose of urban intensification!